Echo360 Personal Capture allows you to make recordings from your office or at home, and publish them via LSE’s lecture recording system. You can record your voice, whatever is on your PC screen and webcam video. To be able to publish recordings to the Echo360 system, you need to be registered as an instructor on an LSE course on Echo360. If your lectures are already recorded you will automatically have an account as an instructor on a course in Echo36. If you want to create recordings for a different course or are not already registered as instructor, contact Imt.Lecturerecording@lse.ac.uk and state which course you wish to publish recordings for. The course will then be created in Echo and you will then receive an email from Echo360 asking you to activate your account if you do not already have one. 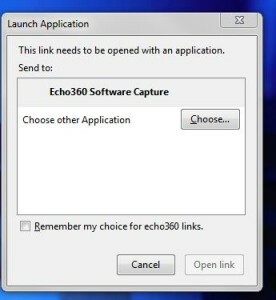 If you are using an LSE Desktop computer, Echo Personal Capture is now available via the Software Centre for Windows. You can download it by simply opening the Software Centre and clicking on the application. Within a few minutes, you should be ready to go. If you have not used the Software Centre before, or do not know what it is, please refer to the guide on the IMT website. The software is available for Windows (7 or later) and Mac, see the Echo360 page for more details. You can download it from the address below simply log in with your account and choose ‘EchoSystem Personal Capture from: https://echo360.org.uk/downloads. After installation select Launch Echo360 Personal Capture and an internet browser will open up and you will be prompted to enter your LSE email address and select LSE from the list of institutions from the drop down menu. You will then be taken to the Echo360 login screen and asked to enter your Echo360 username and password. Once you have logged in you will be asked to launch the application with Echo360 Software Capture – double click on Echo360 Software Capture and it will open up the Echo360 personal capture programme. The first time you start the application, click the large Settings button in the top right corner. You are able to test your connection to the server by clicking the ‘Test Connection’ button and you should get a tick. The Storage Location can be left unchanged. Select Done to go back to the main page. Use the three menus at the top left to select your microphone, the screen you want to capture, and the webcam. Only audio is compulsory, so as a minimum you need a microphone. Use the menu top right to select the quality of your video files. Better quality / Medium or higher are recommended. The lower the quality the smaller the file but the resultant recording may not be fit for purpose. When you are ready to begin, click the blue Record button. After a 5-second countdown, the recording will begin. During the countdown phase, you can load your PowerPoint or whatever application you want to record. To stop or pause the recording, click the Echo360 icon in the task bar at the bottom of the screen, to bring the controls back onto the screen and select. When completed, the recording is listed at the top of the Recordings section in the lower half of the main screen. Hover over it to reveal the Edit button . This takes you to a ‘timeline’ view where you can play back the recording and edit it. To remove sections of the recording, drag the triangular markers from the start of the timeline to either end of the section to be removed, then click Make cut. Continue doing this until you are happy with it. On completion, click Apply edits. For more information on the editing process, see Review and Edit Recordings in Personal Capture for Windows. Click the Publish button to start the process of publishing. Follow the prompts to enter a title, choose the course code to publish to and select the type of output required. Then click Upload. N.B. you will not be able to publish a recording if you do not have instructor access to a course on Echo360 (see the information at the start of this guide). The length of time for the upload will depend on the size of the recording amongst other things. Once processing is complete, you will receive an email notifying you that your video is online and it should now appear in your library in Echo360. Open the Moodle course where you want to share your recording. If you already have a lecture capture link set up for this course then your recording should now be included in the list of available videos. If you do not already have a lecture capture link set up see our guide.